We depart around 7:30AM from our pick up point in Wembley and travel a wonderful journey towards this ISLAND named ISLE OF WIGHT. It is the perfect place to enjoy a relaxing break, at any time of the year. It is a stunning Island with fascinating attractions. It is approximately two and half hour route before we reach a surprising and extravagant pathway towards the island. We approach near Southampton from where we continue to travel in Ferry which is itself a wonderful experience. It is nearly 45 minutes of everlasting experience. Once we reach the Island we will continue our journey to THE NEEDLES PARK. Here you will have two hours to explore yourselves with different attractions after buying the super saver tickets which is economical for everyone. There is alum bay glass factory where you will experience the live demonstration from skilled craftsmen. There is a sand shop where you will be filling a glass shape with layers of different coloured Alum Bay sand. The main attraction of this journey is the CHAIRLIFT (not icluded) travel from the bay cliffs to the bay beach. 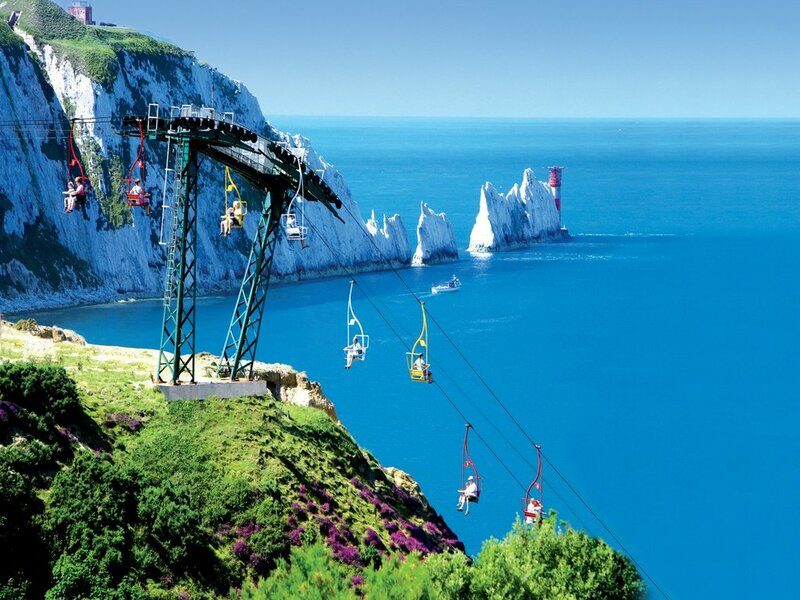 The view from the top whilst travelling to the beach is truly marvellous and once in a lifetime experience, You will get a chance to get down from the chairlift and enjoy the ALUM BAY BEACH and take pictures and capture memories with your friends and family. You can even walk up the cliff or just make a return journey on the chairlift and help yourselves for the lunch. EAST HAM – 6:15 OUT SIDE EAST HAM STATION, HIGH STREET NORTH, E6 2JA. WEMBLEY – 7:15 0UT SIDE SANATAN HINDU MANDIR, EALING ROAD, WEMBLEY, HA0 4TA. HOUNSLOW – 7:45 OUTSIDE HOUNSLOW CENTRAL STATION, TW3 1JG. Complete Return Journey with coach/minibu & ferry. Please note that departure and arrival time may vary depending on the ferry avaibility. Timing given in itinerary? is to give you a rough idea on what to expect on the day.